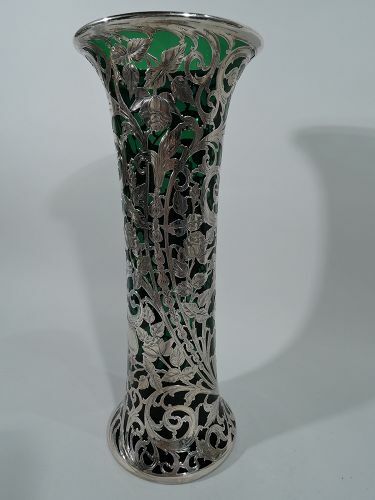 Our sterling silver overlay items certainly make a statement. 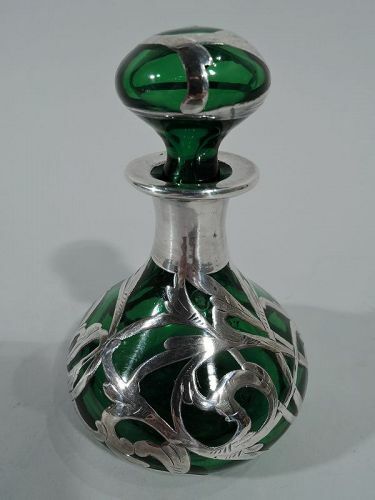 From iridescent glass vases and ruby or emerald glass pieces to silver overlay perfume bottles, our collection contains one-of-a-kind items that are hard to pass up. 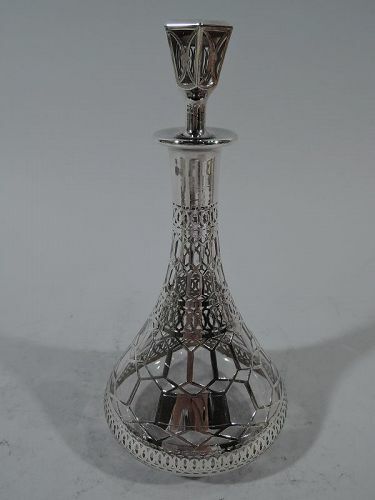 You can use our sterling silver overlay items like decanters and pitchers as your next table centerpiece or to create a pop of color in a room. 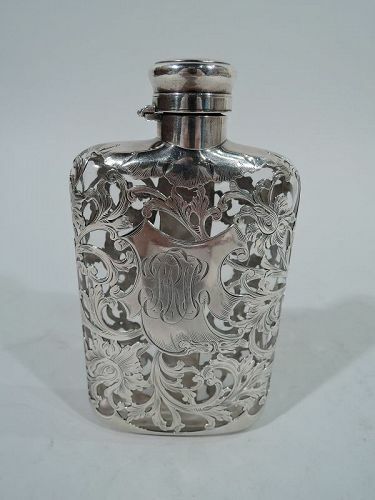 Turn-of-the-century glass flask with silver overlay. Made by Gorham in Providence. 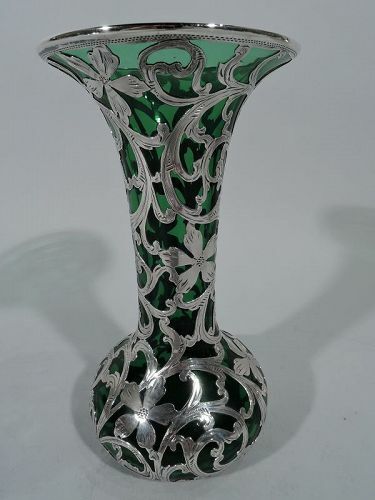 Clear glass with allover silver leafy scrollwork heightened with engraving. On front strapwork cartouche engraved with interlaced script monogram. 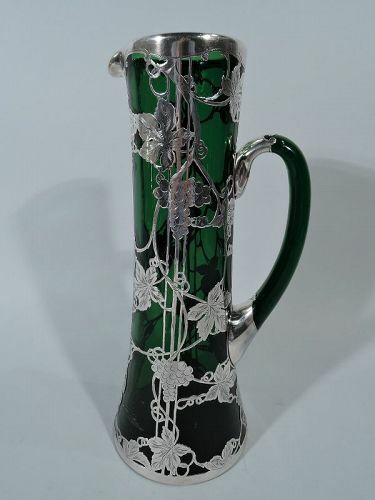 On back solid vertical strip engraved with imbricated leaves on lined ground. Top overlaid with leaf. Short neck with hinged and cork-lined bun cover. 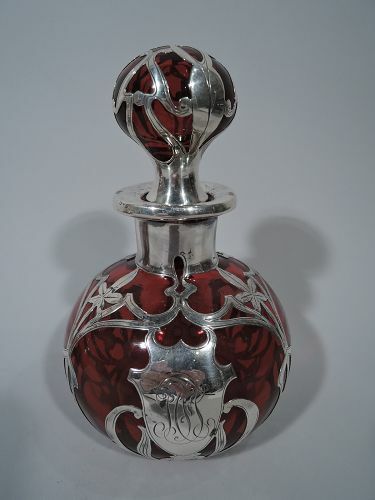 Perfect for a lady’s discreet tipple. Hallmark includes no. S960. Very good condition. 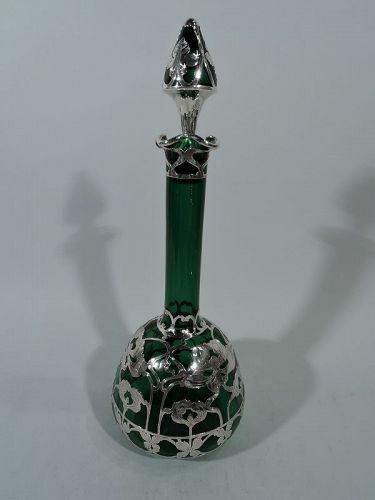 Tall American Art Nouveau emerald glass decanter with silver overlay. Round bowl with columnar neck and ruffled rim. 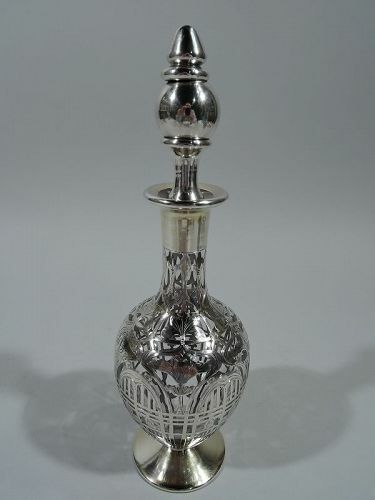 Conical stopper. Spare and fluid overlay in form of loose blooms and whiplash tendrils. Shaped cartouche engraved with single letter monogram. Faint mark. Very good condition. 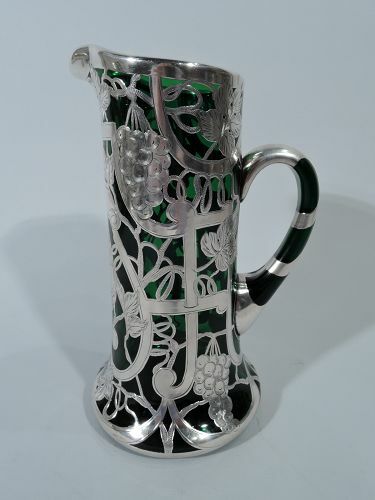 Art Nouveau emerald glass claret jug with silver overlay. Made by Alvin in Providence. Cylindrical with spread base and c-scroll handle. Overlay in form of vertical linear frame entwined with fruiting grapevines. Scrolled cartouche engraved with script letter M. Hallmark includes no. G991/1. Very good condition. 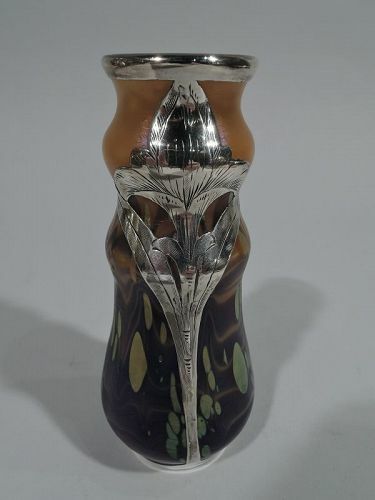 American Art Nouveau emerald glass claret jug with silver overlay. 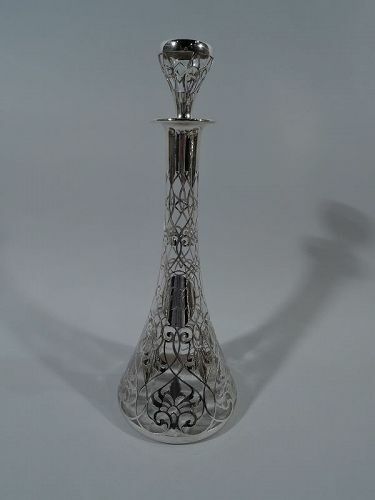 Cylindrical with lip spout, c-scroll handle, and spread base. Strapwork cartouche (vacant) and curvilinear frame entwined with fruiting grapevine. Worn mark. Very good condition.